Forum Index > Off-topic Talk > Can anyone tell me about 16th Portuguese arms and armour? Posted: Sun 04 Mar, 2012 2:48 am Post subject: Can anyone tell me about 16th Portuguese arms and armour? along at some point, problem is she's Indonesian. or is it a whole other style? ( like the conquistadors in the Americas) or did it remain the same. this whole thing might never be necessary but would be good to be prepared, and fun to do something different. Possibly. Spain and Portugal have always had a lot of cross cultural interaction and influence and their material cultures were similar. Also, remember the union between the Portuguese and Spanish thrones between 1580 (i.e. late 16thC) and 1640. Absolutely. The montante was a characteristically Iberian weapon, originating in the 15th or 16th centuries and still in use in the 17th and it was shared between the Spanish (where is is also called a mandoble) and the Portuguese. This I'm not sure about. One thing to consider: if the Jogo do Pau guys are to be believed, the staff was a characteristically Portuguese weapon and sidearm, even for noblemen, from the 16th century onward. As such, even if a montante might not have been common in Southeast Asia, you could probably get away with carrying a staff (and perhaps a rapier or sidesword). Tratado das liçoens da espada preta, de Thomas Luis - Edición crítica por: Manuel Valle Ortiz, Tomás González Ahola, Ton Puey, Jaime Girona. I actually clicked on this link after seeing the title and hoping for a Montante discussion! The Portuguese were in Malaysia during the early 1500's. The controlled Makassar and Timor in indonesia, and also had control of the Maluku islands. All before 1520. -A breasplate with shoulder and extended leg protection, possibly reaching and covering the knees. -An open-faced burgonet helm or cheek-plated morionesk helm, both WITHOUT a high crest (assuming he wants to be able to fight multiple opponents effectively using Godhino's rules of the montante). -Either long gauntlets (almost to the elbow) or full arm protection. If he has a montante, chances are he doesn't have rapier. 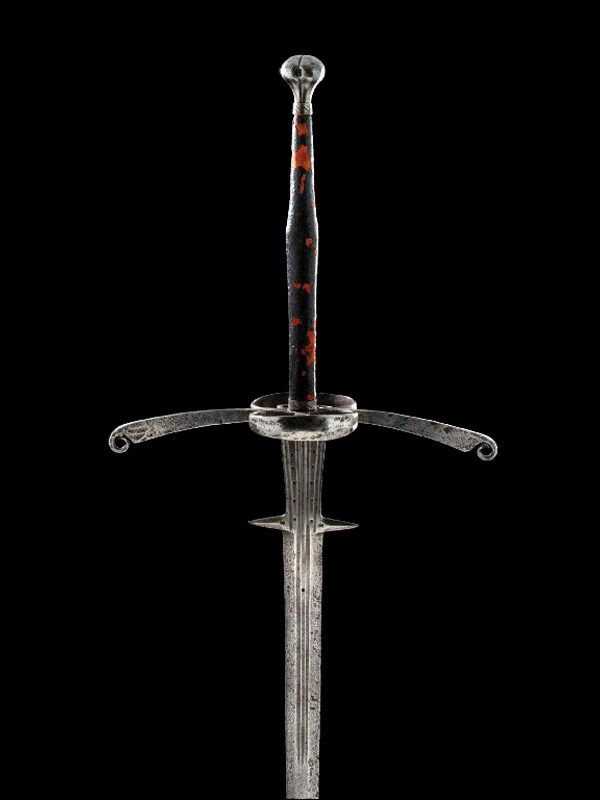 Not for any class or monetary reasons, simply because in battle he would most likely be staring down multiple opponents, so an arming sword would allow him to better defend against multiple aggressors, and allow for more money to spend on his montante. The Iberian system does have plays for fighting with two swords to defend vs. multiple opponents, but I have yet to hear or read of people actually carrying two into battle, chances are they would grab the second sword from the battlefield. a buckler or parrying dagger would be more common as a secondary. If he's in Indonesia with a montante, chances are he's either a guard, advantuer, or heavy infantry(front, standard guardsman, or flanks). and id like to add another question while were on the topic of 16th century gear. what was the armour style worn by partuguese and spanish, particularly the heavy lanncer cavalry not unlike the gendarmes. but what other styles were used once gothic and milanese fell out of use? was the spanish cavalry armour the same as the armour a french gendarme might have? is this just the iberian expression for "twohanded sword" or is it a different style, if yes, what are the charakteristics, what does it differentiate from german "zweihänder" or italian "spadone a due mani" ? and does maybe someone have a photo illustrating the point? Correct me if I'm wrong, but I think these Portuguese had small crews on their ships with professional marines. Since the siege of Lisbon Portugal and England have good connections, including English longbowmen in Portuguese armies. Neither should you underestimate the crossbow that played much longer a more important role in naval than in land warfare as are liable infantry weapon. The African crossbow is a direct offspring of maritime, likely Portuguese, influence http://www.diaspora.uiuc.edu/A-AAnewsletter/newsletter16.html . David Nicolle writes in his Medieval Sourcebooks about cotton armour in especially Latin American and African context. Add to this that the Portuguese first took part in the West African gold trade and later on added East African slave soldiers, so they were very likely influenced by African warfare, especially bodyarmour if I understand that correctly. is a good point to start your search. Richard J. Garrett, The Defences of Macau: Forts, Ships and Weapons Over 450 Years. Hong Kong University Press, 2010. Gottfried, the montante has been getting a little bit of publicity lately around there. you are right it is a sword that's terminology fits a description of "two hander" however i've been looking into a few and finding design difference. it's kind of vague as to how these swords were used. weather they were actual war swords or something more personal such as a dueling weapon. i've been going after information on them for a while but my job has switched over to night shift so there's actually very little i'm getting done right now with them. This is going to get reeeeeeally long, and I'm sorry. The montante is something I've been focusing on recently, and I like talking about it. Yes they did, there's an interesting account of a portuguese ship being attacked by (thai I believe?) pirates, and two brothers with montante held the upper deck while the others armed themselves beneath deck. One of the brothers wasn't feeling so well, and when it looked like he was going to be captured, jumped overboard with his sword and drowned. The other one lived and the other soldiers were able to push the pirates back. I can get a source for this by next sunday, I don't remember it at the moment and can't contact the person who showed it to me. it's kind of vague as to how these swords were used. Yes and no. Some manuscripts have been fully or somewhat interpreted, some haven't even been translated yet. There are many, many manuscripts detailing its use, but curranty most of them are still in interpretation. The montante was used by non-formation fighting troops to engage and kill multiple opponents, they were used to defend people and standards, attack rioters, defend buildings, and assault formations. They were also used by dueling weapons. The montante was wielded arms straight, pommel almost always in line with the body between hips, where power was centered. Static blocks are virtually non-existent, because they tend to lead to a swift and hilarious death when engaging groups and using a polearm sized sword. Beats and displacements figure heavily into it's use, using both body position and the swords leverage to control your opponent's weapon. The Godhino, Anonymous, and the two Figueyredo manuscripts (there are others, and some non-iberian material, but these are the Iberian ones I have experience with) detail the Iberian methods of surviving prolonged combat with the montante very well, and the practitioners of verdadera destreza emphasize that fighting someone who's armed with the montante to be extremely dangerous. I can safely say, from both being the wielder and in the lines being test-assaulted while testing some of the Iberian rules, that fighting someone with a montante is a pain in the neck. 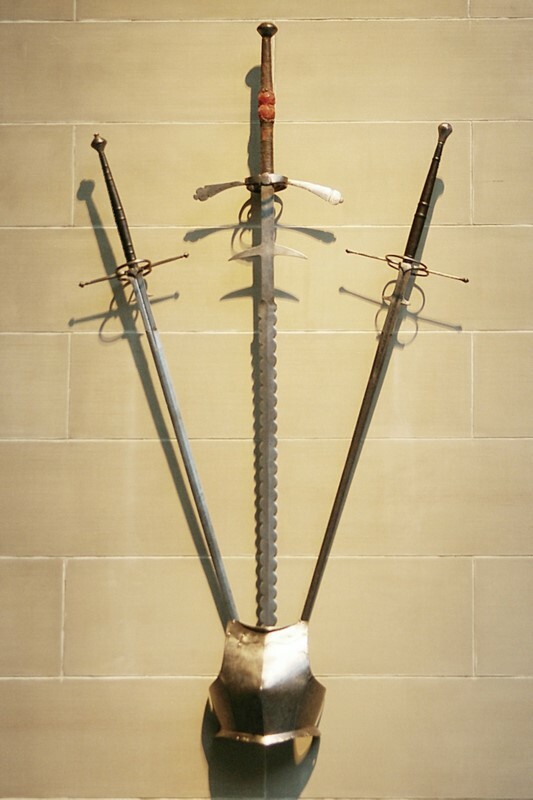 And montante vs. montante is more like "the battle of confusing oversized rapiers" than anything else. There are details to defend from resting position (point down on the ground, standing at attention), fighting on a rowing ship, alleyways, narrow and wide streets, separating combatants, defending fallen people/goods, escorting people, being attacked from in front and behind, fighting while completely surrounded, keeping a crowed from surrounding you, breaking into shield and pike lines, and general methods of combat. And these are just the ones that have been interpreted, there a bunch more. Yah, they're similar to large type XIX with extended ricassos, and parrying hooks that leave just enough room for your hand between them and the cross guard. It makes them nasty and quick, while still having the mass and strength to really smack something without significant trauma to the blade. If you want some more info, there's some stuff here too. http://www.myArmoury.com/talk/viewtopic.php?t=16442 montante discussion shows up in the later parts of the article. Here are some more montante (there can never be enough), you can really see the ricasso/blade thickness differences on the one. The reason montante look different from each other is that they were too expensive to mass produce, so they tend to be unique to the smith and purchaser. so they were very likely influenced by African warfare, especially bodyarmour if I understand that correctly. Interesting you should mention this, I've seen examples of heavily padded spanish armor-clothing, usually sleeveless, like a really long shouldered vest. I don't know if they did this themselves, or are indeed learning from African warfare like you said. (I can see trekking anywhere hot and humid in half plate getting old real fast). I believe the time period it was worn is contemporary with the era at hand though. Hope this massive info-brick helps. thats very informative, thanks a lot for your time. the montante really is a faszinating weapon, and an eye-candy with these long, slender and elegant lines . Vincent, ah finally someone else how i may be able to pick their brain about the Montante sword once i get back into the swing of things (2 more weeks of night shift), the cleveland swords are fairly near to where i live and hopefully i get go out and get a close look at them this summer. i got some information on one and after i put together some sketches i was quick to notice that not only are these swords elegant, but they are quick and have a pretty good smack to them. most of the pictures i've been able to track down all seem to have a hexagonal cross section which i believe attributes to a good concentration of mass even with a slender blade. "There are many, many manuscripts detailing its use, but currant most of them are still in interpretation. The montante was used by non-formation fighting troops to engage and kill multiple opponents, they were used to defend people and standards, attack rioters, defend buildings, and assault formations. They were also used by dueling weapons." I was coming to this conclusion Vincent - some of these swords are highly decorated (yet also battle damaged) which seems to tell that they've had a higher role. not just a standard issue warring weapon, its much more an individual weapon that saw some kind of action. i was forwarded a few videos from another forum member showing the interpretations on it's use and it truly looks like a versatile weapon. i wish the market had something that i could get my hands on to better understand the weapon, but everything i look at still needs to be heavily modified to fit the dimensions i have gathered up. The Portuguese of that period used matchlock firearms, it was the Portuguese that brought the matchlock to Japan in 1543. In the portuguese military, advanturers were forward-deployed non-formation fighting troops. The montante is used by these troops more than most others, simply because they were typically outnumbered, they had room to use them effectively, and you can only fire a crossbow or gun so many times before they figure out where you are and attack. Advanturers overseas were more likely to have less armor than their continental counterparts, I forget why. If not a montante, similar but less expensive weapons would be the flail (fully extended, it was only slightly smaller than the montante, at least the ones covered in verdadera destreza) or a halberd. I would personally prefer the montante because I can use it more effectively up close than a halberd (I found it difficult to fight once they get inside the axe head), that said halberds terrify me. I have little idea how the flail was actually used, though such manuscripts exist. Those long quillons are seriously useful in grappling, assuming it ever comes to that, and it shouldn't when using the montante, but it does happen. The extended ricasso comes in handy too. I personally would think using a pike for non-formation tactics would be a very bad idea. As time progressed there was a trend, in Spain a lot more than Portugal, where the base of the montante was less wide. Consequently you have some later period montante that look more like rapiers, these were used exclusively for dueling. So when looking at historical examples keep this in mind. Typical battle montante were usually around 1.5" wide at the base. thats the thing, they wernt presented as loose formation troops, but instead they were presented as being a unit of dense pike troops. i get hooked on that game almost every winter since i got it. but i wouldn't put too much faith in much historical accuracy in it. there was another that i had found on youtube of one man armed with montante that was fending off 3 attackers each from different positions. i was able to track down a document since vincent's post earlier, after reading it. and watching a few videos about it. anyone with a montante - means serious business. We have records much like the one Vincent recalls ((that one is from Siam, I believe, you saw it from Matt) from Calcut and from Brazil of montante users fighting stupid amounts of folks. Nothing from Japan or China yet. Or Africa either for the Portuguese. The Spanish (and maybe the Portuguese) used a variation of jineta armor and equipment combined with new world cotton armor in the American southwest, no reason to not use that elsewhere. Experience showed mail was not good against stone projectiles and the cotton armor was lighter and cooler. While not Montante, they would be armed with arquebus, sword, adarga and this composite armor. I'm tempted to ask: what does she look like? Indonesia includes a Goddamned huge array of ethnicities, some of which look quite Chinese (or are Chinese) while some others may pass for (surprise, surprise) Native Americans. So, depending on what your sister-in-law looks like, he doesn't have to be a Portuguese-who-brought-a-wife-back-from-these-parts or something like that. Period manuals suggest otherwise. Meyer, Mair, Silver, di Grassi, and others cover single combat with the pike. Silver gave the full 18ft pike odds over all weapons shorter than his perfect length of 8-9ft. Manciolino recommend long weapons over the short ones, recommend the spear (lancia, basically a pike though not necessarily 16-18ft in length) over shorter staff weapons. Now, pikes indeed have trouble against multiple foes out of formation - Silver made this clear - but they're still plenty in deadly in loose skirmishing. Pierre Terrail, the famous Chevalier de Bayard, defended a bridge-head armed only with a pike, killing at least three of his adversaries in the process.